Back in March, Waka released a photo ebook of his designs. The beautiful high-resolution images left my mouth-watering for more, and I wasn’t alone. A number of other AFOLs asked if he could provide instructions for his models. Instead, he mentioned that he was working on a book of designs and techniques. 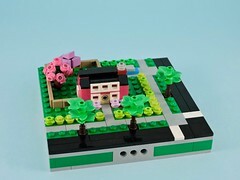 As a fledgling builder, I was interested. 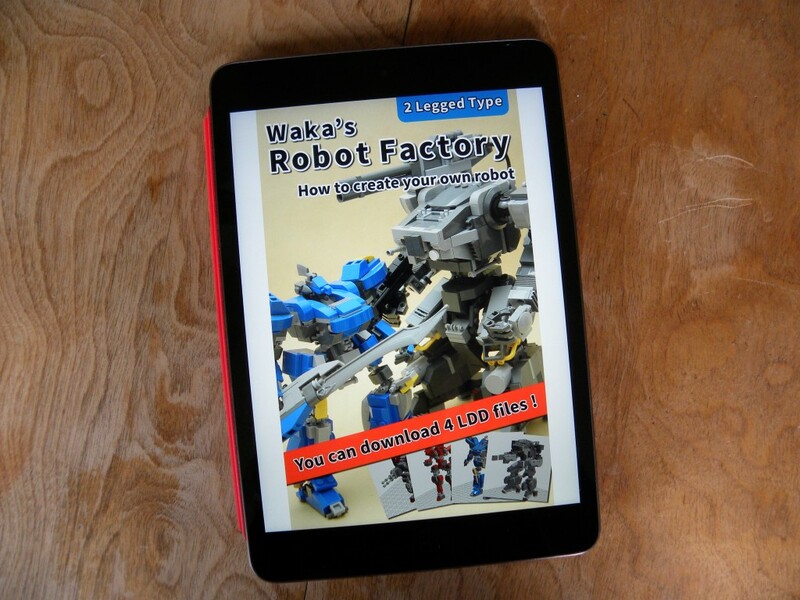 This last week, Waka announced the his new book, Waka’s Robot Factory: How to create your own robot. I bought my copy right away, and as soon as it was downloaded to my iPad, I started flipping through the pages. Much like his last book, the text is sparse, limited to titles and a few labels. I assume that Waka isn’t fluent in English, but this book does have more than the last. The pictures are excellent though, and in the technique sections at the beginning of the book, the elements are color coded to make them stand out. These techniques are simply presented, but contain a wealth of variety. He presents different methods for constructing joints, and other mecha parts like hands and heads, sometimes suggesting intriguing and unusual parts usage. The balance of the book is step-by-step instructions for making four different mecha at a variety of scales. 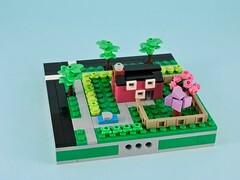 These instructions are definitely for the experienced builder, as they aren’t the piece-by-piece instructions that come with official sets, but a series of images without text or inventories. For builders that are used to building from their imagination, this shouldn’t be a problem, but for those that need super-clear instruction, they may pose some difficulty. One of the cool extras that Waka includes is links to download LDD instructions for each design. He also shows a number of alternate builds for each model, including alternate weapons and limbs. the highlight for me is the minifig-scale mecha. All of the mecha that I’ve built have been microscale (meaning smaller than minifig-scale), and I’ve been looking for some guidance in building bigger humanoid mecha. Though I don’t know that I’ll build Waka’s model, I do know that I will be mining his design for inspiration for my own. All-in-all, another superb little book from Waka. Though it is a bit short, there isn’t any text filling up the space, just 60+ pages of detailed photos for $4.95. If you build sci-fi or mecha, or are interested in getting into it, this ebook is well worth the price!